Orchid Growing: How Much Light Does Your Orchid Need? Orchid Growing: How Much Light? 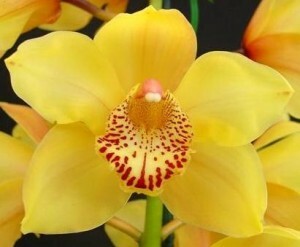 The color of the orchids leaves are a big indicator of the amount of light your orchid is receiving. If you leaves are a dark green color and soft to the touch, then that could mean that your orchid is not getting enough light. If the leaves are a reddish-purple color around the edges or become yellow or lightened in color than this could indicate too much light. It is important that you do not place your orchid in direct sunlight, because if orchids receive direct sunlight, they can often become sunburned which can create brown spots on the leaves of the orchids. In another article about orchids care and light, I talk about how you can use the “hand test” as an alternative way to measure light intensity. Best Exposure: East, West, North, or South? Experimenting with several different spots and light exposures in your house will help you discover the most ideal lighting for your orchid. The brightest light exposure is from the south, which in most cases, is too much sun exposure for many types of orchids. For orchids requiring medium and low light, eastern exposure works well for the majority of the year. When the seasons change, so does the light intensity. For this reason, during the winter months, orchids grown in eastern-facing windows may need to be moved to a southern-facing window. You will probably need to experiment with different spots and light exposures in your house before you find the ideal spot for your orchid, although depending on how much lighting your orchid requires, you can try some of the suggestions below to help you find the best location to place your orchid. If you have a low light orchid the most ideal places to grow your orchid is on an eastern-facing windowsill, within one foot of a western-facing window, within two feet of a southern-facing window, or within one foot of a shaded southern-facing window. If your orchid needs medium light, the best place to set the plant is on a western-facing windowsill, or within one foot of a southern-facing window. If you have an orchid that requires high light then the most ideal spot to place your orchid is on a southern-facing windowsill, or within one foot of a southern-facing window that receives only indirect light. Every time you water your plant, you should do a visual inspection of the leaves to get a good idea of whether you’re providing your orchid with the ideal amount of light. Making sure that your orchid receives the correct amount of light will ensure that your orchid will continue to grow, remain healthy, and live a long (and happy) life!